Experience the true greatness of chocolate and all of the culinary delights it can possess! Enjoy the making and the pleasure of a chocolate workshop with experience days! Chocolate Workshops run on different dates and times throughout the year depending upon location. They will usually take place on a selected Saturday or Sunday at either 12pm or 3pm. All participants under 16 must be accompanied by a participating adult. Please let the centre know upon booking a date of any allergies you suffer from. This experience will last approximately 1.5 to 2 hours depending on the group size up to 36 people. Participants: The Chocolate Workshop is for 1 participant. The maximum group size for the Chocolate Workshop is 36. Please note there cannot be any spectators in the room whilst the class is on. All ingredients and cooking utensils will be provided. This was bought as a gift for me and my daughter. It was truly amazing. We enjoyed learning about chocolate and it's so hands on. Very impressed with Chef, he was very funny and made the experience for us. 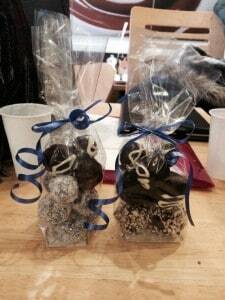 We were impressed with coming away with a few bags of truffles to impress our families and friends. I wrote down the method when I got home, it's so easy and I will be making more. Don't just do this for a birthday, it's a worth treating yourself, anytime! Overall my sister and I enjoyed our experience, but there are a lot of areas where we felt improvements could be made. No welcome, nowhere to put coats or wash hands and briskly told where to stand. There were far too many people taking part (26) so it was difficult to see the demonstrations and we had to stand for the whole time. 30 truffles would be the maximum you could make with the ingredients and although it was an experience "per person" we had to share ingredients and equipment. Thanks to Nettie for making the session so enjoyable. It was particularly interesting hearing about the development of chocolate through the ages from the plantation stage to consumption. The session was well organised and even though I was on my own I didn't feel at a disadvantage as it was great fun being part of the group. 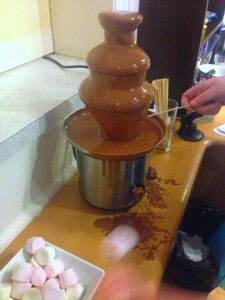 A great experience for any chocoholic! Both my wife and I enjoyed taking part in the chocolate workshop. I would recommend this to anyone with an addiction to chocolate. You walk away with the chocolate truffles that you prepared in the session and knowledge of how to continue making them from your own home. Fantastic course really enjoyable! Shame I had to go to Bath to do it as it was purchased to do at Oxford, which they stopped offering, and as they were only able to offer a Saturday I had to pay an extra £20 although I would have preferred to go on a weekday! This course has exceeded my expectations. It was excellent fun and I would highly recommend it! Upon completion, you will be able to start creating home-made truffles as presents for Birthday, Xmas or special occasions. They always look so delicate but yet are quite easy to make once you know how to do it. Perfect timing - just before Christmas, so could make these into unique handmade gifts. I had to do the experience in Bath as could not get in to Cardiff before my voucher ran other, this was the only downside of the whole thing as once there we had a really great time. As a big chocolate fan it was the perfect choice for me, will highly recommend it to every one I know and since they have tasted the treats I brought home they will be wanting to do it themselves. 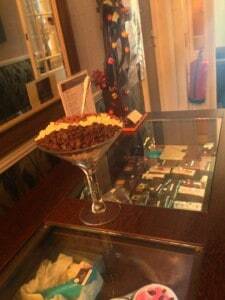 The venue for our workshop was the extremely fitting ‘Chocolate Boutique Hotel’ in Bournemouth. We were greeted by the friendly receptionist and given directions through the gloriously chocolatey themed hotel. We passed bowls brimming with chocolate chips, portraits of celebrities hand painted in chocolate, and the luxurious décor made us feel like we were entering into a magical chocolate world. As we entered the workshop we received a warm welcome from Chris, our master chocolatier for the day. We found our workspace and introduced ourselves to the fellow chocolate lovers who were taking part in the fun. To start off, we tasted high quality, 60% dark chocolate chips and as the bowl was being passed around the group, it’s safe to say we entered chocolate heaven. These delights, along with an actual chocolate fountain – complete with marshmallows for dunking – were available to be scoffed upon throughout the whole day. Chris continued with a highly enlightening talk about the history, health benefits, origins and processes used in making chocolate. Who knew that eating dark chocolate and drinking red wine (in moderation of course!) is actually beneficial to your health? Or where the average bar of Cadbury’s actually comes from? As Chris’ fun and engaging talk came to an end, our sights set upon the bowls of shining, melted chocolate seated on the table in front of him. Time for the truffle making to commence! We were given a demonstration on the first stage of the process: combining cream and melted chocolate to form the soft centre of truffles. This required a volunteer from the group to lend a hand with the vigorous mixing that is needed for the two elements to combine and the piping that readies the chocolatey mix for rolling into bite size balls. As we donned our much needed aprons – we were about to get messy – we quickly realised that it was not as easy as Chris had made it seem! However, there was no need to worry as we all achieved truffle sized balls of ganache in the end. 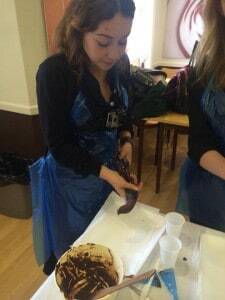 We were then shown the second stage of creating truffles: tempering the chocolate (otherwise known as making it nice and shiny) to coat our truffles with! With a volunteer in tow, Chris amazed us with his skills in handling chocolate and we became eager to get coating and decorating our own chocolates. An inviting selection of chopped nuts, cocoa powder, icing sugar, coconut and white chocolate was available to decorate our truffles with and to finish it off, we were provided with cute gift bags and ribbons to take our creations home in. The end result looked very professional and was the perfect gift for a loved one – or just to devour, ourselves! The whole experience was great fun and would be very well suited for couples on a romantic getaway, hen parties, or for those who just want to learn how to make delicious handmade truffles at home. 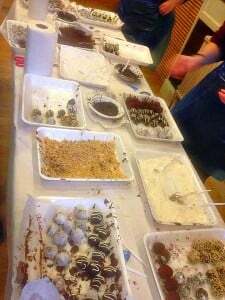 Can this chocolate making workshop be booked for a child? Yes, the minimum age for this Chocolate Workshop experience is 10 years. However, anyone under the age of 16 years must be accompanied by a participating adult. 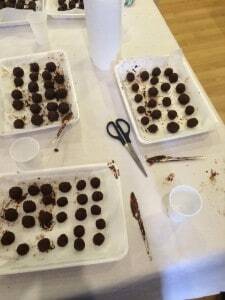 Can you take home any chocolate you make at the Chocolate Workshop? Any chocolate you make at the Chocolate Workshop you do get to keep and take home. What time does the Chocolate Workshop start? The times for the Chocolate Workshop can vary. They generally start at either 11am, 12pm or 2pm and last for around 2 - 2.5 hours. Are you required to bring your own apron along to the Chocolate Workshop? Aprons as well as all ingredients and cooking utensils will be provided on the day. Could you please let me know if there is a maximum group size? The maximum group size they can take is 18. Is the chocolate used and made during this workshop gluten free? Yes, the chocolate used in the Chocolate Workshop experience is gluten free. Once the truffles have been made, there will be the option to top these with a variety of ingredients such as nuts, icing sugar mixed with cornflower, cocoa powder and coconut - participants do not have to use these if they would prefer not to. What is the minimum age requirement? The minimum age is 10 years old. All participants under 16 must be accompanied by a participating adult. Is the chocolate workshop suitable for those with nut allergies? We would not recommend the chocolate workshop to those with severe nut allergies, as they are used for decoration and various ingredients may contain traces also. Is there an age restriction to the Chocolate Workshop? The minimum age for the Chocolate Workshop is 12 but those under 16 will need to be accompanied by a participating adult.